Interstate 17 is one of the two north-south Interstate highways in Arizona, and one of the two Interstate highways to never leave the state. The road connects the low desert of Phoenix with the high mountains of Flagstaff, providing a (relatively quick) route between the two cities. Interstate 17's tale is tied with the route it replaced - Arizona 69. In the 1930s, traffic planners realized the need for a faster route between Phoenix and Prescott. At the time, traffic had to take US 89, which was somewhat out of the way. A new route up Black Canyon, called Arizona 69, was added to the state highway system in 1936, appearing on maps in 1938. The road was completed by 1940 to Prescott, and paved progressively up to Prescott. In the 1950s, a new route was needed to Flagstaff, as U.S. 89A was restricted due to the grade out of Oak Creek Canyon. A new route was designated in 1954, called Arizona 79 (recycling the original number from the road through Oak Creek Canyon). As part of the Interstate Highway system, a route was designated from Phoenix to Flagstaff. This route became Interstate 17. Interstate 17 begins near Sky Harbor Airport at Interstate 10, and travels west and north around downtown Phoenix, forming the west and south legs of the "inner loop". After crossing Interstate 10 again at the Stack interchange, the freeway heads due north roughly along 25th Avenue, transitioning to a 27th Avenue alignment at Dunlap Avenue. The freeway heads due north, meeting Loop 101 and Arizona 74 as it continues toward the suburb of Anthem. After leaving Anthem, Interstate 17 finally leaves the Phoenix Metropolitan Area, reaching the towns of New River and Black Canyon City before leaving the low desert to climb quickly up to Black Mesa, passing through the ghost town of Bumble Bee. At the edge of the mesa is the Sunset Point rest area. The road stays fairly level at around 3500 feet elevation until passing Cordes Junction, where Arizona 69 branches off. Leaving Cordes Junction, Interstate 17 travels north and drops down into the Verde Valley to reach the town of Camp Verde. Leaving Camp Verde, Interstate 17 passes the road to Montezuma Castle National Monument and Montezuma Well National Monument, and meets Arizona 179 to Sedona. Passing Arizona 179, Interstate 17 starts climbing again in earnest, to reach 6500 feet in elevation at Munds Park. After passing Flagstaff Airport, Interstate 17 reaches Interstate 40 just south of Flagstaff. Interstate 17 between Interstate 10 (24th Street) and the Durango Curve (22nd Avenue) was originally part of Interstate 10, but added to Interstate 17 when Interstate 10 was realigned. From Cordes Junction to Flagstaff, significant portions of Interstate 17 were originally constructed as a two-lane Interstate highway, with the other two lanes added later. The entire freeway was completed by 1978. The mileposts on Interstate 17 begin at Milepost 194. 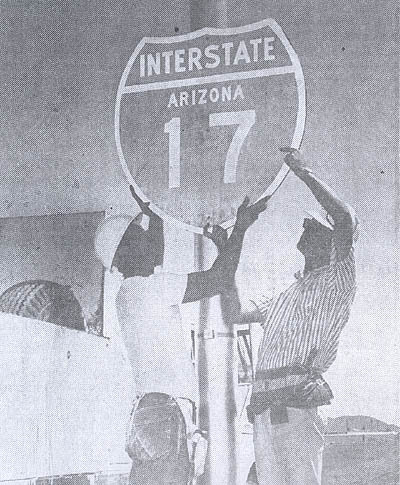 Interstate 17's mileposts came from Arizona 69, which began at mile 201 of U.S. 89 originally (where the Grand Avenue overpass of Interstate 17 is today). Since Interstate 19's mileposts also correspond to U.S. 89, it has led to some speculation that Interstate 17 and 19 were supposed to be one freeway, which has never been in state highway system plans. Dates noted are dates that the sections opened. In the case of the freeway north of Thomas Road, this is when Arizona 69 was turned into a limited access freeway. The section from Miles 293-340 was constructed as Arizona 79, and converted to a limited access highway before completion. The majority of this section (miles 298-337) was constructed as a "super two" (one lane each direction) limited access freeway. Dates are included for when the additional lanes were added to the freeway. I-17 has one decommissioned business loop. Black Canyon City - former Arizona 69.